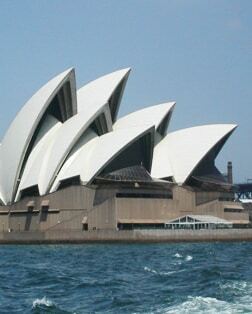 This masterpiece of late modern architecture is a symbol of both Sydney and Australia. It has earned a reputation as a world-class performing arts center and is a UNESCO World Heritage Site. Spanning Sydney Harbour from the central business district to the North Shore, this icon, nicknamed the "coat hanger" by locals, is the world's widest long-span bridge and tallest steel-arch bridge. The sandstone cliffs of this region were once believed impassable. Today this major gateway to Western New South Wales boasts ancient ravines, lush forests and stunning waterfalls. Enjoy face-to-face encounters with one of the country's largest private collections of native Australian animals in a natural bush setting, easily accessible and within metropolitan Sydney. This beach is one of Australia's most popular for residents and tourists. At a little over a half-mile long, this stretch of sand plays host to numerous festivals and events each year. Also known as Lady Macquarie's Chair, this famous attraction was carved from a rock ledge for Governor Macquarie's wife, Elizabeth and offers excellent views of Sydney Harbour. Sandstone cliffs give the area its name. Site of the first penal settlement, the district is rich in colonial history and is home to 5 star hotels, restaurants, pubs, shops, galleries and museums. Discover the "Grand Canyon" of giant rock formations, geological history, deep, tree-studded valleys and cascading waterfalls. View the world famous rock formation, The Three Sisters, and panoramic views of the Jamieson Valley, Mount Solitary and the Ruined Castle.